An impressive introduction to digital learning, the SMART Board 480 interactive whiteboard offers natural touch functionality, which makes it easy for students and teachers to use and will help enable quick and successful adoption. Like all SMART Board interactive whiteboards, the 480 is part of a comprehensive solution that includes support, professional development, classroom content and a community of peers, so teachers feel comfortable using the 480 and integrating it into their teaching. 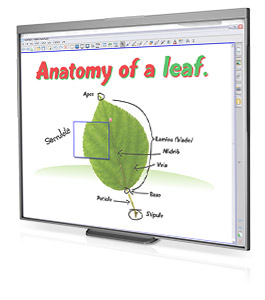 Combining the simplicity of a whiteboard with the power of a computer, the SMART Board 480 interactive whiteboard connects to a projector to display a teacher's desktop on the interactive whiteboard. Teachers can then control applications on the screen, write notes in digital ink and save their work to share later. The 480 also comes with SMART Notebook collaborative learning software, which helps teachers create, deliver and manage high-impact interactive lesson activities. The key to the SMART Board 480 interactive whiteboard is touch. Teachers and students can write, erase, move objects and control applications using a finger or a pen. And with the 480, delivering dynamic lessons is easy. Teachers can present material featuring large, vibrant images. Kinesthetic and visual learners benefit from interacting with lesson content – moving letters, numbers, words and pictures with their fingers. And students with special needs benefit by being able to see, read and manipulate information more easily.